Are you ready to level up your career with Linux s kills? As the founder of the Linux Training Academy and an instructor of several courses, I’ve had the good fortune of helping thousands of people hone their Linux skills. Interacting with so many people who are just getting started with the Linux operating system has given me invaluable insight into the particular struggles and challenges people face at this stage. Make the most out of your time. One of the biggest challenges for people interested in learning the ins and outs of Linux is simply a lack of time. When you are working with a limited and extremely valuable resource you want to make sure you make the most of it. The next biggest challenge for Linux newcomers is knowing where to start. There is so much information available that deciding what to focus your attention on first is a big enough hurdle to keep many people from even starting. What’s worse is starting down the path of learning only to discover too many concepts, commands, and nuances that aren’t explained. This kind of experience is frustrating and leaves you with more questions than answers. That’s why I’ve written this book. Not only have I condensed the most important material into five sections, each designed to be consumed in a day, I’ve also structured the content in a logical and systematic manner. This way you’ll be sure to make the most out of your time by learning the foundational aspects of Linux first and then building upon that foundation each day. Proven step-by-step method used by 1,000’s of students. 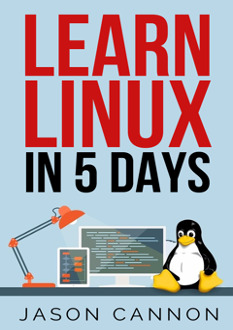 In Learn Linux in 5 Days you will learn the most important concepts and commands, and be guided step-by-step through several practical and real-world examples. As new concepts, commands, or jargon are encountered they are explained in plain language, making it easy to understand. Very helpful and straight to the point. Why I especially recommend Cannon’s book is that he takes the time to explain what other books simply assume you already know. Incredible. Definitely easy to read and understand. Organized clearly (thank goodness – wow), which makes it simple to search by subject or command. Thank you!! Well written. Easy to follow. This is great for beginners such as me. I found the book easy to understand and a good foundation to build upon. Great introduction to the command line environment. The examples given are very simple, clear and consistent throughout the book. I’m confident that you’ll absolutely love Learn Linux in 5 Days. But… if for any reason you are not 100% satisfied I’ll give you your money back — no questions asked. What software is needed to connect to Linux from Mac and Windows computers. Screenshots included. What SSH is and how to use it, including creating and using SSH keys. Where to go for even more in-depth coverage on each topic.